veryone feels sad from time to time. It’s only natural. Most people go through blue days or just periods of feeling down, especially after they experience a loss. 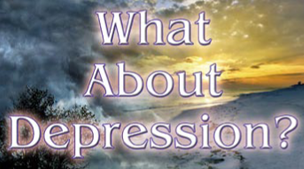 But what experts call clinical depression is different from just being “down in the dumps.” The main difference is that the sad or empty mood does not go away after a couple of weeks – and everyday activities like eating, sleeping, socializing, or working can be affected. A depressive disorder can change a person’s moods, thoughts, and feelings. Without appropriate treatment, this condition can go on for a very long time – weeks, months, or years. Even among those suffering from depression, most do not know they have a treatable condition. Most blame themselves or may be blamed by others. This leads to the alienation of family and friendswho, if they knew of the illness, would likely offer support and help find effective treatment. A lthough this is one of our most devastating emotional disorders, treatment can bring relief to over eighty percent of those who experience depression. Impulsive actions with damaging consequences (e.g., charging up credit cards, sudden love affairs, etc.). Post-Partum Depression is linked to hormonal changes following the birth of a child. This can be a serious form of depression, sometimes with psychotic features, but most sufferers respond well to treatment. Seasonal Affective Disorder or SAD is found among those who are sensitive to the shorter days of winter, especially those who live at northern latitudes. Many people with SAD respond to daily exposure to full-spectrum lighting. Try not to set difficult goals for yourself or to take on more responsibilities than you can realistically handle. Break large tasks into smaller ones. Set priorities and take things one at a time. Learn to comfort yourself when you feel depressed. Realize that you may have negative thoughts – and that they are a symptom of the depression. One thing you may focus on in therapy is turning negative thoughts into positive ones. It is important during a depression to avoid the use of alcohol or drugs. While you may feel a temporary “high,” this can lead to a dangerous pattern of highs and lows which can ultimately create a negative spiral that is very difficult to get out of. Recognize that there are certain times of the day when you feel better. Use these times to your advantage. While it may seem impossible, try to get some exercise. Pumping up your heart for even half an hour every other day does wonders for your mood, and you can do this by taking a walk. Don’t blame yourself, though, if you cannot accomplish as much as you think you should. Treat yourself, everyday if possible, to some activity that makes you feel better. Take a walk in a park or enjoy a bubble bath. Read an interesting article, listen to some music you like, or attend a social or religious function. ____	My future seems hopeless. ____	I do things slowly. ____	Pleasure and joy have gone out of my life. ____	I feel sad, blue and unhappy. ____	I have difficulty making decisions. ____	I feel that I am guilty and deserve to be punished. ____	It takes a great effort to do even simple things. ____	I have had thoughts about hurting myself. ____	I feel depressed even when good things happen. ____	I have negative thoughts much of the time.